RACHEL DUFFY will never forget the final words of her husband Malcolm: “I love you. See you soon.” Tragically, he would not. His words came as he was wheeled into the operating theatre for a lung transplant that was supposed to save his life. She said: “We never spoke again. Mal died two weeks later without ever regaining consciousness. “I’d deliberately decided not to say goodbye as they took him to theatre. Now I can’t get his face out of my mind. “Mal was trying to be brave. But he was scared and crying. Rachel, 34, has told of her anguish after The Sunday Post revealed a double transplant tragedy when two patients were given lethal cancer from organs from the same donor. 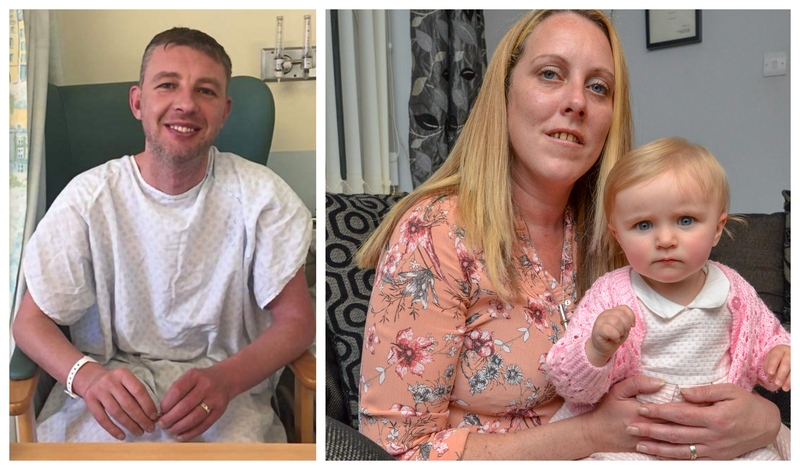 Her husband died after surgery at the same transplant unit where Tom Tyreman, who later died of cancer, had received a new liver while Pauline Hunt, from Ayrshire, has been given the same deadly diagnosis after receiving a kidney from the same donor. Transplant medics insist every possible check is done on organs in the limited time available but Rachel is tortured by unanswered questions. She said: “One of the lungs had to be removed within days and after Mal died the remaining lung was found to have pneumonia and bacteria. I’m still fighting to find out if the donor had pneumonia or some kind of problem with his lungs before he died and whether he was carrying the bacteria. Malcolm Duffy, from Middlesbrough, was just 34 years old when he died in April. “He’d adopted my son Connor when he was one,” said Rachel. “We’d just had baby Charlotte four months before the operation that was supposed to change our lives. My husband wanted to live to see our kids growing up. Diagnosed with pulmonary arterial hypertension in 2004 – high blood pressure in the arteries that fed his heart and lungs – Malcolm could not remain on medication forever but was not “at death’s door”, says Rachel. A lung transplant was his best chance of a life without being constantly tired and breathless. The transplant team at the Freeman Hospital in Newcastle, the same hospital where Tom Tyreman had died only weeks before, removed Malcolm’s lungs four hours before the transplant. Malcolm never woke up from the transplant and for the next two weeks his body battled septic infection. He also had a hole in his heart larger than surgeons had expected and he suffered bleeding and blood clots, leading to one of the transplanted lungs being removed. At the inquest, it was revealed bacteria was identified on lung tissue. Malcolm’s medical records state the Klebsiella bacterial infection was “the cause of his final severe septic episode”. A pathologist told the inquest pneumonia was also found in the remaining transplanted lung. After the transplant, blood clots were found in the veins of the new lungs – something the surgeon had never seen before. During the inquest the Freeman hospital’s consultant revealed Malcolm had become infected with what he described as “bad bugs” and confirmed they had come from the organ donor. Despite undergoing rigorous medical tests before being given the all-clear for transplant, the inquest was told Malcolm also had a narrowing at the junction of his heart which had not been spotted. The young dad’s cause of death was ruled by the coroner as multiple organ failure after bilateral lung transplant-ation for pulmonary hypertension. Rachel added: “Mal had trusted the staff at the Freeman because they’d treated him for years for pulmonary hypertension. “I still can’t look at all his medical records or talk about his last two weeks without breaking down. “He should be here with us this Christmas. Instead he’s gone and we have this huge hole in our lives. Like the Tyreman family and Pauline and Gordon Hunt, Rachel had to fight to get answers. Rachel is joining the fight for a parliamentary inquiry. The Freeman hospital refused to answer our questions about whether Malcolm’s lung donor was suffering from pneumonia or bacterial infection. IT’S very sad when anyone dies after a transplant. This partly reflects the nature of transplantation – it is usually a last resort, when all other treatment has failed and the patient has to take the significant risks associated with the transplant. As a lung transplant surgeon I can outline some of the difficult decisions transplant teams have. A key part of the lung transplant is the retrieval of the donor lungs. An assessment is made by retrieval surgeons, putting together an overall picture of the lungs from X-rays, measurements of oxygen levels in the blood and physical appearance. Donation and transplant teams don’t use lungs with obvious diseases such as pneumonia or cancer, but sometimes there is an infection at such an early stage it is impossible to detect. The most difficult part of the operation is often removal of the recipient’s lungs. This can often take several hours. The organs from the donor, including lungs, deteriorate when they are removed from the body and they must be transplanted within hours. For this reason, the recipient’s lungs are usually removed first, to ensure the donor’s lungs spend as little time as possible deteriorating outside of the body. All donor lungs are damaged to some degree as a result of the problems which led to the person becoming a donor. To find some evidence of early infection is actually very common. Lung transplant patients receive antibiotics to reduce the risk of infection from bacteria. This deals with any bacteria in the recipient and potential infections in the donor. However it is typically 24 hours before the results of detailed bacteria tests on donor lungs can be confirmed. The transplant team will then modify the antibiotics. All transplants carry risks, but these must be balanced against the risks of remaining on the waiting list. This is a particular problem for lung transplants, because of the shortage of suitable donor lungs. Three years after being put on the waiting list, 26% of all lung transplant patients have died without getting a transplant due to the shortage of donors, and another 9% have been removed from the list as they had deteriorated beyond the stage where a transplant could succeed. Thus more than a third of people put on the lung transplant waiting list do not survive to have the op. Last year alone, 65 people died waiting for a lung transplants.